First off can I just say: I love The Bay Area. This video is split into two sections, the first part is a tour of urban Berkeley that Mark Bittman takes with 2 U C Berkeley professors: Phil Stark and Tom Carlson. 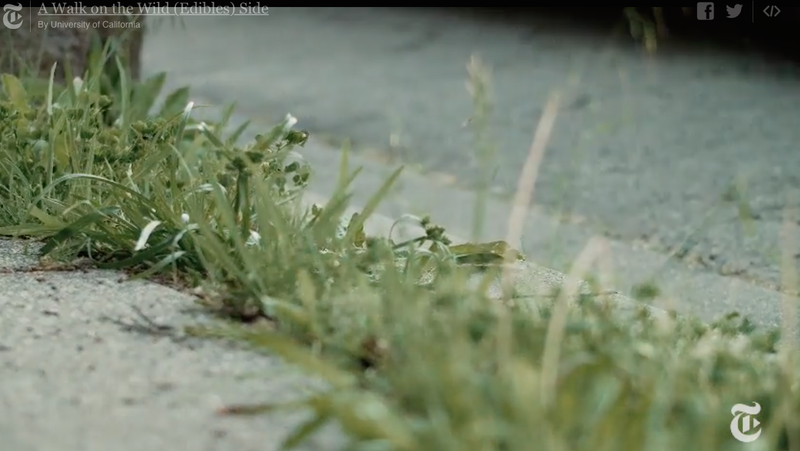 They go on an urban foraging walk to discover that, basically all those weeds in between sidewalk cracks and in people’s front lawns or even growing by creepy abandon buildings are mostly edible, some of them are even tasty, all of them are free (just be sure to wash them first). Bittman also discusses how “weeds” are finding their way on to menus of many fine dinning establishments, Chez Panisse probably being the most famous. The video then switches focus from urban to rural and to Green String farm where Bob Cannard has being growing weeds for 30 years. It’s fascinating and provocative. What are these weeds that we keep trying to kill with chemicals, oh they’re food too? But I thought they were bad? Watch it, share your thoughts. This entry was posted in Other Stuff, Politics, Travel, Video and tagged Berkeley Food Institute, bob cannard, Green string farm, growing weeds, Mark Bittman, New York Times, Phil Stark, Tom Carlson, U C Berkeley, Urban Forgaging, Weeds as food. Bookmark the permalink.